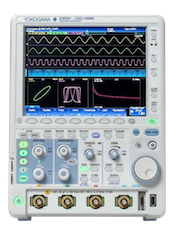 There are two methods to programmatically determine if the calculations for waveform parameters is completed on the DL series oscilloscopes. This will ensure that no other commands are executed until the measurement phase is completed. Please see the attached Pic1.jpg diagram to view the implementation of this method in LabVIEW. This method must be completed in two parts. The first part sets the instrument to monitor the falling edge of bit-8 of the Extended Event Register. The second part will be to read the value of the register. ii. Send the :STATUS:EESR? command to read the return value of the register. This value will be 128 when the waveform parameter calculations are complete. Please see the attached Pic2.jpg diagram to view the implementation of this method in LabVIEW.